I've built a successor to the original LeMons BumperCam camera, and the Heroic Fix Award-winning Volvo Amazon-driving Tunachuckers let me install it on their C pillar. Then their new B20 engine got a bit fiery. 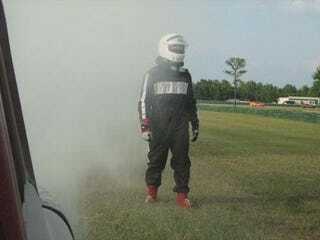 Here's a shot of their driver, moments after escaping his burning car at the side of the racetrack. BumperCam 2.0 (aka C PillarCam) captured plenty more good shots as well, so check back later for highlights. That engine compartment looks pretty bad, but the Tunachuckers say they have all the parts they need to get the car back on the track tomorrow. In fact, they're already tearing it apart as I write this. Go, Tunachuckers!